(now they are 9, 7 and 4). The day began with some home made waffles, sliced fruits, smoked salmon, and eggs. I even asked the oldest if she'd like a splash of coffee in her large mug of warm milk. They are being big decision makers today! We emptied their piggy banks, and visited the local community bank to deposit some money into their "junior savers program" that happened to have a Christmas event scheduled for the kids. The place was packed! "Not many kids were depositing. Most people came to see Santa." was observation from my daughter. The day before, they had written a list of all the people to buy presents for. So they deposit some, and determine a set amount for spending (ex. 25 dollars for 20 people on the list - one must remember the taxes! 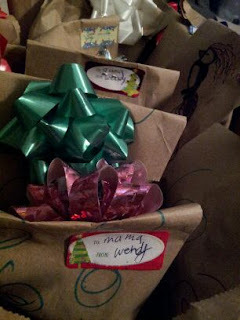 ), and we visit the dollar store so the kids could participate in "buying gifts for everyone" in a way they can afford. This year, they said they would also like to buy some books at the library's book sale (they are in the $1 range). We take each of them down the aisles of the store, and ask who is next on the list, and whether they think ______ would like that item they are holding in their hands? It's funny because the first year, I could see them only putting things THEY would love into the cart. "Do you think Uncle Tony really wants that pink jump roooope?" "Yes. He will love it!" They look forward to this annual bonanza, and I'm glad to see them grow to have pride in the gifts they give, and experience joy from their thoughtfulness. :) They sit there and watch as grandma opens the gift and exclaims "oooh a ... ....a loofah! Thank you! ", but the kids give a shy smile and skip to the next person. Sometimes I've noticed that Christmas seems to be a day to shower children with gifts so it seems one directional, and I'm glad they can be involved in the gift giving exchange. Some families do something similar or have children make crafts as gifts to family. What do you do? I, myself, remind them that it is the thought that counts and haven't ever been a proponent of spending insane amounts during Christmas. But of course, I do get some gifts for friends and the family. I just refuse to spend ridiculous amounts. I really could do without presents, and enjoy the seasonal traditions - caroling at the senior home with the family, potato latkes and playing dreidel with our Jewish friends during Chanukah, making "gingerbread" houses out of graham crackers with our friends, cooking prime rib for Christmas dinner, and baking cookies for our neighbors. Those memories, and wonderful smells are what make our family's Christmas from the heart. Well... I'm no one special. Front yard garden..finally Started Edible landscaping to french potager. Our village is discussing sustainability measures! That No-Knead Bread recipe : If I can do it, anybody can.